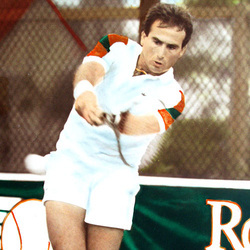 An NCAA All-American at Miami in 1971 and 1972, Eddie Dibbs is one of the most widely recognized names in University of Miami tennis history and also among the international professional tennis ranks. In three seasons as a Hurricane, Dibbs rolled up an incredible singles record of 56-4 for a 93% winning percentage. He also was the key figure on Miami teams which compiled a three year record of 57-3 from 1970 to 1072 under the direction of head coach Dale Lewis. Described by Lewis as one of the most colorful players you ever wanted to see, Dibbs brought flare and style to the collegiate scene with his counter-punching tennis tenacity. In a distinguished professional career, Dibbs won 22 singles championships and earned a top-10 world ranking for six consecutive years, 1976-1979. His highest career world ranking was at No. 6 in 1977 and 1978. Although he never won a grand slam singles title, Dibbs collected more than one million in career prize money. His highest singles finish in grand slam competition came at the French Open in 1975 and 1976 when he reached the semifinal round in both tournaments.